Mandates can be hard to pin down, especially for programmes or activities that are undertaken as a regular part of the work of a department or division. The Office for Internal Oversight Services (OIOS) and the Joint Inspection Unit (JIU) both produce documents about the work of various departments and divisions. Often these reports include an introduction with extensive historical background information. There may also be details about specific activities undertaken by the department. 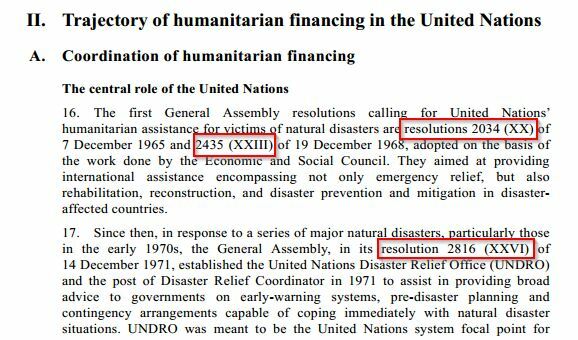 For example, A/67/867 transmits a JIU report on Financing for humanitarian operations in the United Nations system, which details the "trajectory of humanitarian financing in the United Nations". The Index to the Proceedings allows one to trace the documentation related to a particular agenda item over time. The Yearbook of the United Nations includes the full text of all resolutions of the principal organs and can be searched full text for specific words or phrases. It is important to read documents carefully. UN language can be difficult to interpret. Check citations. A resolution may "take note" of a report of the Secretary-General and "approve" the report of the Advisory Committee on Administrative and Budgetary Questions (ACABQ): it may be necessary to read both of the reports to understand exactly what was approved (or not). 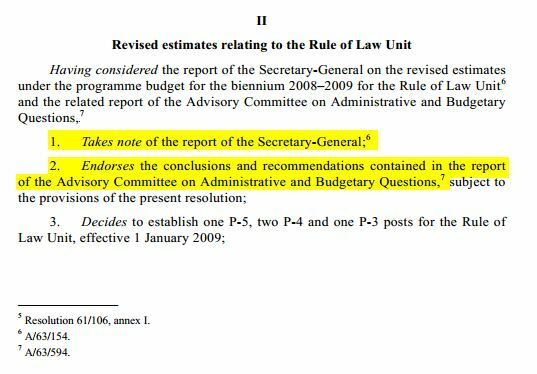 For example, the resolution that approves the resources for the establishment of the Rule of Law unit is, A/RES/63/263, Questions relating to the programme budget for the biennium 2008–2009, section II: Revised estimates relating to the Rule of Law Unit. To find out what the General Assembly endorsed, it is necessary to check A/63/594, the report of the ACABQ as well as A/63/154, the report of the Secretary-General. Details about the functions of the Rule of Law Unit are set out in the report of the Secretary-General.